“More of our people go to the films on Sunday evening than to church,” says the Rev. R. C. R. Godfrey, 34-year-old vicar of Aldeburgh, Suffolk, so after Evensong service on Sunday, he will go along to the local cinema and preach to the audience. “I think it is my business to seek them out,” he says. 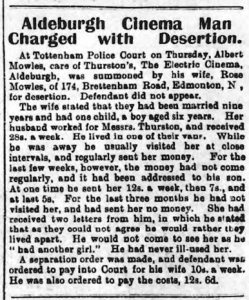 At Tottenham Police Court on Thursday, Albert Mowles, care of Thurston’s, The Electric Cinema, Aldeburgh, was summoned by his wife, Rosa Mowles, of 174, Brettenham Road, Edmonton. Defendant did not appear. The wife stated that they had been married nine years and had one child, a boy aged six years. Her husband worked for Messrs. Thurston, and received 28s. a week. He lived in one of their vans. While he was away he usually visited her at close intervals, and regularly sent her money. For the last few weeks, however, the money had not come regularly, and it had been addressed to his son. At one time he sent her 12s. a week, then 7s., and at last 5s. For the last three months he had not visited her, and had sent her no money. She had received two letters from him, in which he stated that as they could not agree he would rather they lived apart. He would not come to see her as he “had another girl.” He had never ill-used her. A separation order was made, and defendant was ordered to pay into Court for his wife 10s. a week. He was also ordered to pay the costs, 12s. 6d.